Best-selling author Kate Mosse reveals how Ulster-Scots writer Helen Waddell has influenced her, and uncovers the fascinating story of how Waddell’s life and work intertwined. Groundbreakers – Helen Waddell: Living The Past was made with funding from Northern Ireland Screen’s Ulster-Scots Broadcast Fund and airs this Sunday, 2nd December at 10.10pm on BBC Two NI. Waddell was an Irish literary superstar in the 1930s, but apart from certain academic circles, is largely forgotten today. Her 1933 novel Peter Abelard was a bestseller; and she was feted by the literati, politicians, and even royalty. She was a pioneer of the type of historical fiction that is so popular and respected today. The youngest of 10 children, Helen was born in 1889 in Tokyo, where her father – a Presbyterian minister and missionary – was working. Her mother died when she was three-years-old and after her father’s death in 1901, Helen and her older sister Meg returned to Ireland to live in Belfast where she became a pupil at Victoria College – then a pioneering establishment in terms of education for women. 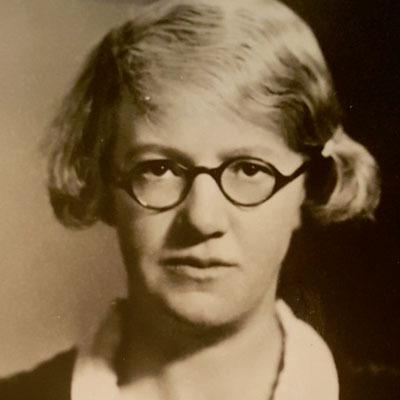 And then, after eight years spent nursing her ill stepmother, at 31 years of age, she continued to break the mould by studying for a doctorate at Oxford University’s Somerville College – founded to give women, at that time excluded from membership of the University, the chance to benefit from an Oxford education. During the course of the programme, Kate discovers how Waddell’s fascination with the famous medieval lovers Abelard and Héloïse had a profound and startling effect on her own romantic life.